Last month, we closed out the first round of the 51st State Solar Co-op, our first solar co-op focused on expanding solar access to low- and moderate-income households in the District. We are excited to say that of the 145 total participants, 22 homeowners spread across 7 Wards have qualified for Solar for All grant funding so far! This co-op is a project funded by Solar for All, a program of the District of Columbia’s Department of Energy and Environment that seeks to provide the benefits of solar electricity to 100,000 low-income households and reduce their energy bills by 50% by 2032. The program, which was established by the Renewable Portfolio Standard (RPS) Expansion Amendment Act of 2016, is funded by the Renewable Energy Development Fund (REDF). For more information about Solar for All visit: http://doee.dc.gov/solarforall. 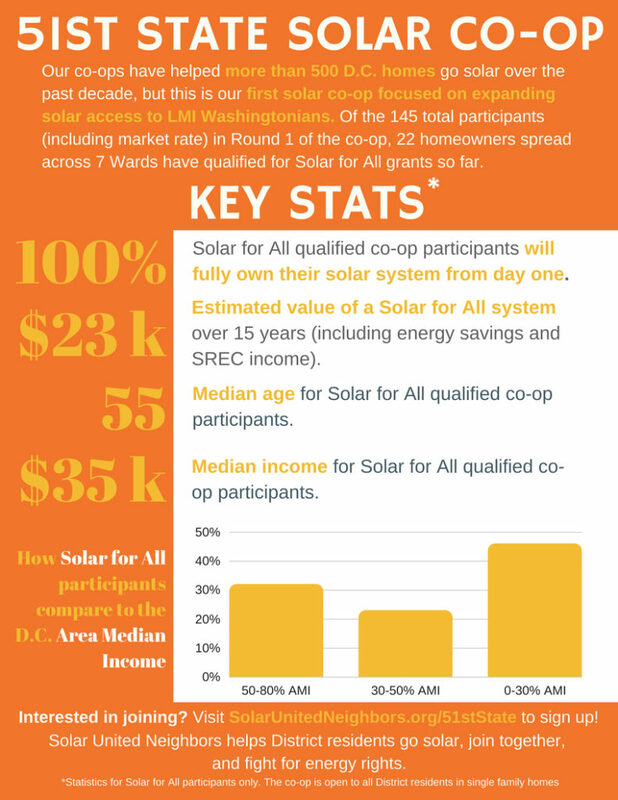 The 51st State Solar Co-op Round 2 will focus on expanding access to solar for low- and moderate-income households, no matter your neighborhood or income. Join us to learn more at one of our upcoming information sessions (full details below). You can also learn more by visiting the co-op landing page.